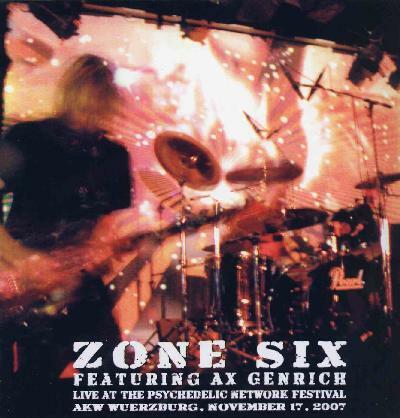 Zone Six - "Live at the Psychedelic Network Festival 2007"
This is a limited edition CD-R of the bands amazing performance at the Psychedelic Network Festival in November 2007 and featuring Ax Gengrich from Guru Guru. The recording is very good and starts off very spacey with everyone noodling around and finding their path to enlightenment. The end has a really cool groove going on. Next up is the 25 minute High Traffic. This is probably the best jam on the CD. It is slow to get going but then around 5 1/2 minutes some killer guitars are played and the band just takes off. At 10 minutes it is very psychedelic and everyone is pretty spaced out. Around 13 minutes it comes down and a really cool bass line leads the band into the next section. The next groove takes off around 20 minutes and has cool interweaving guitar parts. Psychedelic Beer at 2PM is next and starts slow and spacey and stays this way until around 8-9 minutes when the guitars decide to kick it up a notch with some noisy soloing. Sounds from the Stomach is a really cool short piece I think perhaps it is mainly Ax or Julius and their guitar effects pedals with a bit from Martin on Synths. Sei auf der Wurst begins with Dave saying Keith Henderson's sie auf der Wurst... I am not sure what it means though. The track starts real slow but then a cool wah wah guitar is played while the others seem to bounce back and forth off each other. Weird jam, a little jazzy. Kosmokaos ends the concert and has more energy and the band play a strange groove, with one playing a like 50's rock and roll guitar line and the other just freaking out until it all sort of comes together. Spaced out band. Fun stuff to listen to. Fans of freeform psychedelic music will dig it!